For some reason, Japan has a plethora of homeless cats. Any one out there know why? Tokyo is no exception. Many seem to be tolerated and even well-fed by well-meaning folk. The lucky ones are rescued, rehabilitated and re-homed but the unlucky probably end up at that death trap better known as the hokenjo or public welfare agency. Yesterday, while exploring a park in Aoyama unbeknownst to us before, Pippi and I noticed a homeless man who has claimed a bench for his abode. Nothing too unusual about that. Though the authorities would rather we think that Japan has no homeless problem, there are plenty of people who bed down nightly in cardboard boxes and makeshift shelters. Some of these constructions can be very elaborate and well appointed. Usually they belong to human beings. 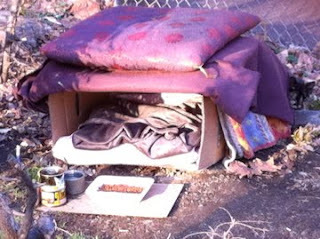 A few feet away from the bench-house, we spotted this cozy box and its feline denizen, a dark brown tabby of some sort. In addition to soft bedding inside, an old zabuton cushion on the roof provides extra insulation. Someone has carefully laid out dry food in a dish and stacked some tinned food for later on. We could not tell if this lucky kitty belongs to the homeless guy or is just well tended by the people living in the houses that ring the park. Either way, this cat is homeless no more.